Perhaps you’ve seen one of these very small, 1.75 inches tall, lead Eiffel Tower souvenir building replicas and wondered….why is it so small and what’s up with that hole on the top. 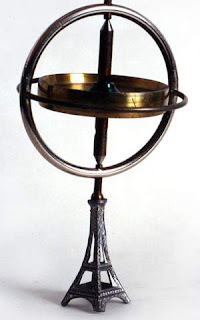 It was made to hold a spinning top…or, more accurately, a gyroscope, which became popular in the 1920's. Once it’s spinning, the gyroscope can be placed on the stand and it will balance and continue twirling. If this was to scale, can you imagine how large the top would be? It would look in an enormous flying saucer had landed on the Tour Eiffel. Do you know of other souvenir building top stands? Let us know by clicking on the ‘comments’ link below.